If you've ever gotten an e-mail from me, I end it with an African Proverb: On the day of victory, no one will be tired. That proverb has served me well in terms of hoping for/expecting/wanting a victory so some of our social ills can be solved and have a definitive end. Until that day comes, there are agencies that have committed themselves to the process of helping us one day arrive at that "victory." Last week Tuesday, I got a chance to attend the 10th annual meeting to hear a report on Sankofa Safe Child Initiative (SSCI). They are located at 1500 S. Keeler in the North Lawndale community. The meeting was held at the brand new Hartgrove Hospital, 5730 W. Roosevelt Road. The partnership between those two agencies is a perfect fit. Sankofa, which means "looking back to go forward," has taken on several areas of social need. One of their biggest initiatives is focusing on grandparents/kinship caregivers raising children and youth who have aged out of foster care. To accommodate those families, they built Sankofa House, a five-story, 58-unit residential facility at 4041 W. Roosevelt Road. SSCI also offers services in job training, life skill, parenting classes, GED, expungement, child care and counseling/mentoring, just to name a few. They also offer a wonderful boutique, It's In The Bag, at 2413 W. Madison. SSCI is the brainchild of Executive Director Annetta Wilson, who is barely 5 feet tall, but what she lacks in physical height she makes up for in energy put forth. She has given her best to SSCI and demands the same of her staff. One of the questions I posed to Mrs. Wilson was how SSCI ended up partnering with Hartgrove Hospital. For years she had known Chuck Levy the Community Relations representative from the hospital. Because of their mutual concern about issues on the West Side, they developed a personal relationship which led to a business arrangement as well. For years, I have driven by Hartgrove Hospital's site at 520 N. Ridgeway. I knew they dealt with mental health issues, but that issue wasn't on my immediate radar. About three years ago, the hospital moved to the new location on Roosevelt Road. Attending the annual report meeting was the first time I had been at the new facility, and I admit I didn't know it was there. I do remember when the land was vacant and plans had been announced for the new development that would occur on it. But I also have to admit the furthest I had ventured was into the new Aldi's on south Central Avenue. Hartgrove Hospital's new building is beautiful and the staff was very pleasant. They offer services for all age groups who have behavioral issues. They are especially concerned about children and adolescents who display sexually problematic behavior. Other services include substance abuse, neuropsychiatric inpatient services, self-injury services, and corresponding services in Spanish. I want to keep highlighting the little-known-but-positive forces at work here on the West Side. When places such as SSCI and Hartgrove Hospital are put on people's radar, then we know where we can go or send our love ones for treatment. And when those persons have been treated and are "cured," that is a victory we all can celebrate. Merry Christmas and Celebrate Kwanzaa. 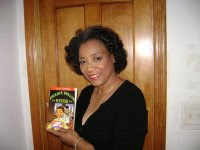 I'll be at Malcolm X every day, beginning the day after Christmas, as part of the Chicago Black Author's Network. It goes on each day through New Year's Day, and there is plenty of free parking. Come out and join in the activities.